Boy I sure haven't been able to blog much lately and it really bothers me but sometimes that is life. I do have a finish that I can write about, once I'm able to get pictures of it of course. Stay tuned for that. The reason for my current absence? It's that time of year again. Yes my life at the moment is all consumed with Girl Scout cookie season. 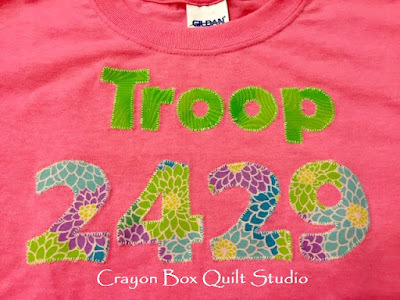 Not only am I keeping track of the sales for my entire troop of 11 girls but Sunshine and I have been going out every weekend during the day to knock on our neighbors' doors. She set herself a big goal for this year (the same as she actually sold last year = 650 boxes) so that is a lot of doorbells to ring. A few of my readers also purchased cookies from Sunshine last year through the Digital Cookie program but this year due to technical difficulties with the actual program, our Girl Scout council is not utilizing it so we have to take the orders and ship them ourselves. No biggie but I've had to do some weighing and figuring of shipping costs for those orders. 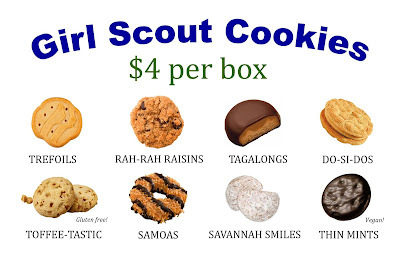 If those same ladies (or anyone else) needs their Girl Scout cookie fix, we'd be happy to send some your way. Just email me. I am getting in a tiny bit of sewing too but this is also for my Girl Scout troop. 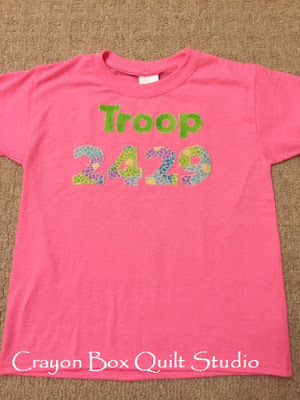 My girls wanted troop t-shirts and after looking at countless options online and the girls not really liking any of them, I'm making them myself. The tracing and cutting of the letters is taking more time than the actual sewing is but I like the way they are coming out. The first event that we will wear them at is later this month so I need to get all 13 completed soon. Hopefully after they are done, I'll finally have time to get back to some regular sewing. The shirts are super cute, Michele. Good luck with the sales. I'll have to scour the stores to find the girls selling them and get our favorites before they sell out. At least I know WHERE I can find them should that happen. yes I have already bought three boxes myself from girls around school. 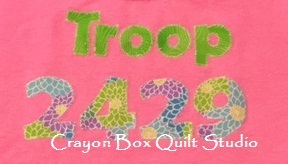 LOVE your troop shirt!! Such good memories being made. Glad you are enjoying this stage of parenting...it goes way tooooo fast! I was just wondering if you were buried in cookies right now. 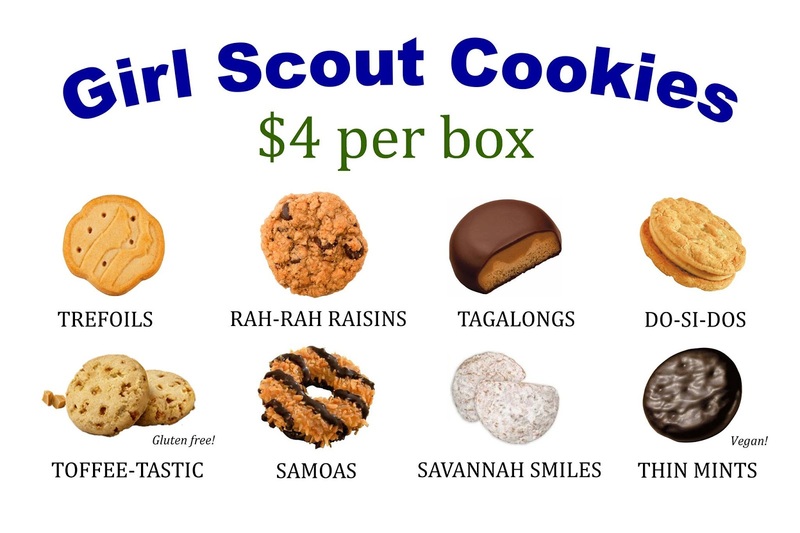 I might need a case of the Samoas shipped to me -- I never have cash when the girls are out and it doesn't help that hubs and i like so many of the flavors. I'd have loved to have some, but customs regulations makes it impossible, sorry. 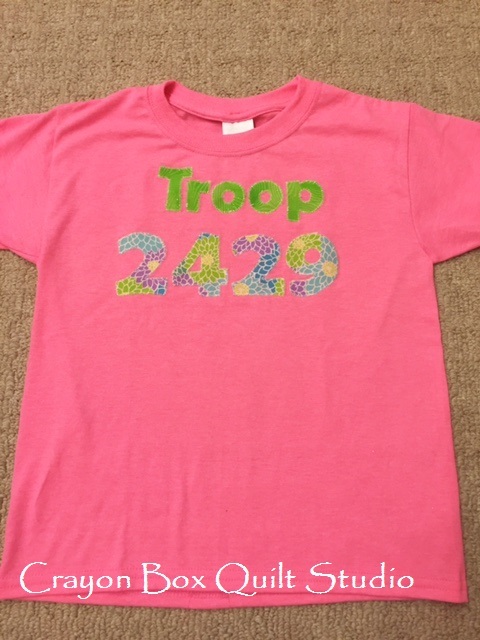 The Troop tee shirts look great. I would have loved to wear one when I was a GS. The tee shirts are adorable. Much prettier than when I was in Girl Scouts many moons ago.